Are you doing Collaborative Research? Get insights from leading psychological scientists! 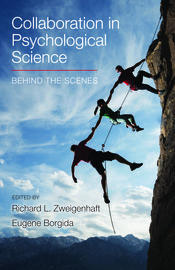 This remarkable collection of essays gives students and other researchers a firsthand look at how collaborative scientific research is done. Does the substantive domain in which the collaboration occurs shape the nature of the collaboration? How have technological advances changed collaboration? Are there particular issues that arise for students collaborating with faculty members, or faculty members collaborating with students?